If you're into food, writing, parenting, and natural and organic stuff, you've come to the right place. Last week I shared an all-natural DIY home remedy for sinus congestion and colds that has been especially helpful to me during my pregnancy. Another issue I’ve had during both my pregnancies is migraines (I get them when I’m not pregnant too, but they are infinitely worse for me during pregnancy). My neighbor shared with me a recipe for an all-natural headache remedy and I wanted to pass it along to you. In the last three or so years I’ve been dealing with migraines I’ve learned the hard truth that for me, there is no one cause, and there is no one right answer. So while this treatment was certainly helpful in easing the pain, it’s not the silver bullet I’ve been searching for (which I’m still hopeful I can find once I’m done with pregnancy and nursing). However, I have many “tools” in my arsenal against migraines, and I’m happy to add this remedy as one more thing I can use. If you have more of a “regular” headache this may be just the thing you’re looking for, and if you try it, I hope it helps you! The recipe below will fill half of a small mason jar. Double the quantities to fill an entire jar. 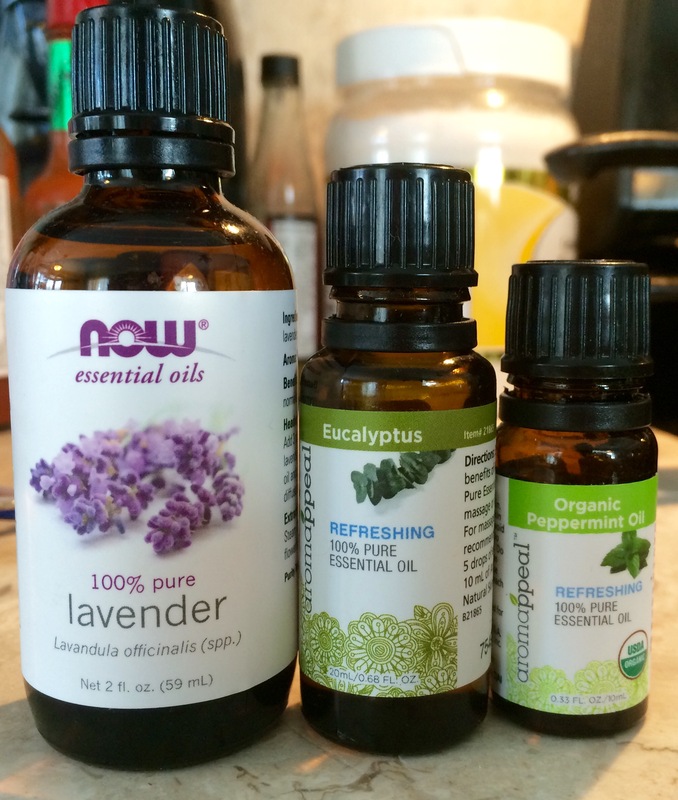 You can also adjust the amount of essential oils you use to suit your preferences. 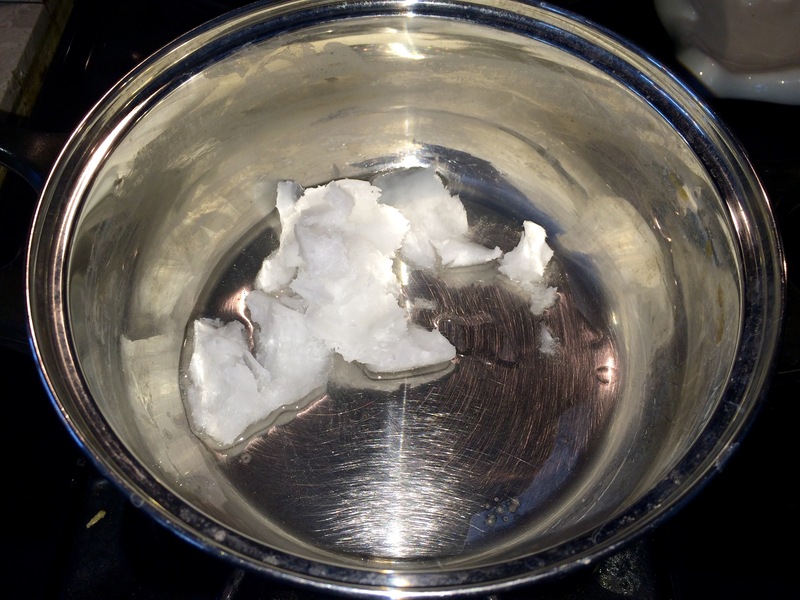 In a small saucepan, melt the coconut oil. Add the peppermint, eucalyptus, and lavender essential oils. Stir a few times to blend the ingredients together. 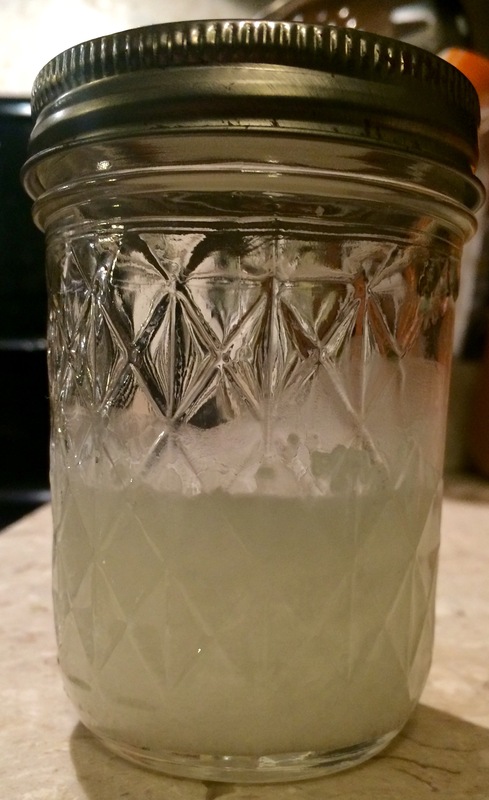 Pour the mixture into a clean mason jar. Allow the oils to cool and solidify (this will take a few hours so I recommend making this when you don’t have any head pain; if you make it while you have a migraine like I did you’ll be waiting awhile). Once the oil is solid, rub on your forehead, behind your ears, and between your shoulder blades. I also rubbed it on other sore spots where the migraine causes pain such as my jaw, temple, scalp, and around my neck. Again, it wasn’t a cure-all, but when used in conjunction with other migraine remedies it was quite soothing. A secondary benefit I noticed was the skin on my forehead looked and felt great where I had rubbed in the oil. The smell of the lavender oil helped me to relax which can be difficult when your brain feels like it’s caught in a red-hot vice grip. What are your favorite ways to use coconut oil and essential oils? Very cool! I love how versatile coconut oil is. I just wrote a post on my favorite ways to use it. Thanks BreAnna! I love how versatile coconut oil is, too. Thanks for sharing your post, as I love learning new ways to use it, and hopefully others can learn, too!